Not to be confused with Airblue or Blue Air. A jetBlue Airways Airbus A320-200 at Westchester County Airport. jetBlue was incorporated in Delaware in August 1998. David Neeleman founded the company in February 1999, under the name "NewAir". JetBlue started by following Southwest's approach of offering low-cost travel, but sought to distinguish itself by its amenities, such as in-flight entertainment, TV at every seat, and Sirius XM satellite radio. In September 1999, the airline was awarded 75 initial take off/landing slots at John F. Kennedy International Airport and received its USDOT CPCN authorization in February 2000. It commenced operations on February 11, 2000, with services to Buffalo and Fort Lauderdale. jetBlue's founders had set out to call the airline "Taxi" and therefore have a yellow livery to associate the airline with New York. The idea was dropped, however, for several reasons: the negative connotation behind New York City taxis; the ambiguity of the word taxi with regard to air traffic control; and threats from investor JP Morgan to pull its share ($20 million of the total $128 million) of the airline's initial funding unless the name was changed. jetBlue was one of only a few U.S. airlines that made a profit during the sharp downturn in airline travel following the September 11, 2001 attacks. The airline sector responded to jetBlue's market presence by starting mini-rival carriers: Delta Air Lines started Song and United Airlines launched another rival called Ted. Song has since been disbanded and was reabsorbed by Delta Air Lines and Ted reabsorbed by United. 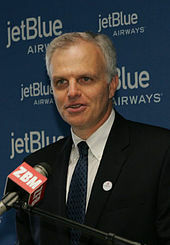 jetBlue Founder David Neeleman in 2006. In October 2005, JetBlue's quarterly profit had plunged from US$8.1 million to $2.7 million largely due to rising fuel costs. Operational issues, fuel prices, and low fares, JetBlue's hallmark, were bringing its financial performance down. In addition, with higher costs related to the airline's numerous amenities, JetBlue was becoming less competitive. For many years, analysts had predicted that jetBlue's growth rate would become unsustainable. Despite this, the airline continued to add planes and routes to the fleet at a brisk pace. In addition in 2006, the IAM (International Association of Machinists) attempted to unionize JetBlue's "ramp service workers", in a move that was described by JetBlue's COO Dave Barger as "pretty hypocritical", as the IAM opposed jetBlue's creation when it was founded as New Air in 1998. The union organizing petition was dismissed by the National Mediation Board because fewer than 35 percent of eligible employees supported an election. jetBlue experienced its first-ever quarterly loss during the fourth quarter of 2005 when the airline lost $42.4 million, enough to make them unprofitable for the entire year of 2005. The loss was the airline's first since going public in 2002. JetBlue also reported a loss in the first quarter of 2006. In addition to that, jetBlue forecasted a loss for 2006, citing high fuel prices, operating inefficiency, and fleet costs. During the first quarter report, CEO David Neeleman, President Dave Barger, and then-CFO John Owen released JetBlue's "Return to Profitability" ("RTP") plan, stating in detail how they would curtail costs and improve revenue to regain profitability. The plan called for $50 million in annual cost cuts and a push to boost revenue by $30 million. jetBlue Airways moved out of the red during the second quarter of 2006, beating Wall Street expectations by announcing a net profit of $14 million. That result was flat when compared to jetBlue's results from the same quarter a year before ($13 million), but it was double Wall Street forecasts of a $7 million profit, Reuters reports. The carrier said cost-cutting and stronger revenue helped it offset higher jet fuel costs. In October 2006, jetBlue announced a net loss of $500,000 for Quarter 3, and a plan to regain that loss by deferring some of their E190 deliveries and by selling 5 of their A320s. In December 2006, jetBlue, as part of their RTP plan, removed a row of seats from their A320s to lighten the aircraft by 904 lb (410 kg) and reduce the cabin crew size from four to three (per FAA regulation requiring one flight attendant per 50 seats), thus offsetting the lost revenue from the removal of seats, and further lightening the aircraft, resulting in less fuel burned. In January 2007, jetBlue returned to profitability with a fourth quarter profit in 2006, reversing a quarterly loss in the year-earlier period. As part of the RTP plan, 2006's full-year loss was $1 million compared to 2005's full-year loss of $20 million. jetBlue was one of the few major airlines to post a profit in that quarter. While its financial performance started showing signs of improvement, in February 2007, jetBlue faced a crisis, when a snowstorm hit the Northeast and Midwest, throwing the airline's operations into chaos. Because jetBlue followed the practice of never cancelling flights, it desisted from calling flights off, even when the ice storm hit and the airline was forced to keep several planes on the ground. Because of this, passengers were kept waiting at the airports for their flights to take off. In some cases, passengers who had already boarded their planes were kept waiting on the apron for several hours and were not allowed to disembark. However, after all this, the airline was eventually forced to cancel most of its flights because of prevailing weather conditions. The fiasco reportedly cost JetBlue $30 million. In 2007, jetBlue was also facing reliability problems with its Embraer 190 fleet. For a couple of months, jetBlue contracted ExpressJet to operate four Embraer 145 regional jets on behalf of jetBlue. While this was going on two E-190 aircraft at a time were sent to an Embraer maintenance facility in Nashville, Tennessee. ExpressJet operated routes between Boston Logan and Buffalo, New York and Washington Dulles, and between New York–JFK and Columbus, Ohio (has terminated) and Richmond, Virginia. David Barger after a presentation in October 2010. Following the February 2007 incident in which the airline was forced to cancel nearly 1,700 flights due to winter storms, jetBlue's board of directors replaced founder and Chief Executive Officer David Neeleman with Dave Barger. He had politicked the board, while Neeleman was busy publicly apologizing. Barger's ascendancy caused widespread demoralization in the ranks. He became JetBlue's new Chief Executive Officer on May 10, 2007. Neeleman, the company's founder and largest individual investor, became a nonexecutive chairman as a result of the change. On July 24, 2007, jetBlue reported that its second-quarter revenue increased to $730 million, compared to $612 in 2006. Second quarter net income grew to $21 million for the quarter, from $14 million the previous year. CEO David Barger said the airline will take delivery of three fewer planes this year and will sell three planes from their current fleet, "slowing capacity growth ... to strengthen our balance sheet and facilitate earnings growth", but will continue to add two to four new destinations each year. In July 2007, the airline partnered with 20th Century Fox's film The Simpsons Movie to become the "Official Airline of Springfield". In addition a contest was held in which the grand prize would be a trip on JetBlue to Los Angeles to attend the premiere of the film. The airline's website was also redecorated with characters and their favorite jetBlue destinations and the company was taken over by the show/film's businessman villain Montgomery Burns. In August 2007, the airline added exclusive content from The New York Times in the form of an in-flight video magazine, conducted by Times journalists and content from NYTimes.com. On November 8, 2007, jetBlue appointed Ed Barnes as interim CFO, following the resignation of former CFO John Harvey. On December 13, 2007, jetBlue and Germany-based Lufthansa announced jetBlue's intent to sell 19% of jetBlue to Lufthansa, pending approval from US regulators. Following the acquisition, Lufthansa stated they plan to seek operational cooperation with jetBlue. Lufthansa plans to offer connections to JetBlue flights in Boston, New York (JFK), and Orlando International Airport (no longer a connection). jetBlue expanded service to the Caribbean, including to St. Maarten and Puerto Plata commencing January 10, 2008. With these additional destinations, jetBlue serves a total of twelve Caribbean/Atlantic destinations including Aruba; Barbados; Bermuda; Cancún; Nassau; Aguadilla; Ponce; San Juan, Puerto Rico; Santiago; and Santo Domingo, Dominican Republic. In the March edition of Airways Magazine, it was announced that once jetBlue partnered with Yahoo! and with BlackBerry producer Research in Motion, that the airline would offer free, limited Wi-Fi capabilities on a single aircraft, N651JB, an Airbus A320-232 dubbed "BetaBlue". People access e-mail with a Wi-Fi capable Blackberry, or use Yahoo! 's e-mail and instant messaging with a Wi-Fi capable laptop, while in flight over the US. LiveTV in Melbourne Florida, created and operated the "BetaBlue" prototype. The "BetaBlue" system utilized the bandwidth and infrastructure of defunct Airfone. On March 19, 2008, jetBlue added Orlando, Florida as a gateway focus city to international destinations in the Caribbean, Mexico, and South America. New international routes from Orlando International Airport include Cancún, Mexico, Bridgetown, Barbados, Bogotá, Colombia, Nassau, Bahamas, San José, Costa Rica, and Santo Domingo, Dominican Republic. In conjunction with the addition of new routes the airline will continue significant expansion of operations at Orlando International Airport including a planned 292-room lodge that will house trainees attending the existing "JetBlue University" training facility (opened in 2015). On April 8, 2008, jetBlue introduced a new "Happy Jetting" brand campaign. The marketing campaign, developed in partnership with JWT New York, emphasizes competitive fares, service and complimentary onboard amenities such as free satellite television and radio, snacks, and leather seats. On May 21, 2008, jetBlue named Joel Peterson chairman and Frank Sica vice chairman of its board of directors, replacing David Neeleman, who stepped down as CEO in 2007. On August 4, 2008, the Associated Press reported that jetBlue would replace their recycled pillows and blankets with an "eco-friendly" pillow and blanket package that passengers would have to purchase for use. Each package will cost $7 and will include a $5 coupon from retailer Bed, Bath and Beyond. This decision is the latest in a series of moves designed to increase revenue. jetBlue told the Associated Press that it expects to collect $40 million from passengers selecting seats with extra legroom and $20 million from passengers paying $15 to check a second bag. As of September 8, 2008[update] JetBlue charges passengers $10–30 for an extended-leg-room seat depending on the length of the flight. In September 2008, jetBlue began operating Republican Vice-Presidential candidate Sarah Palin's campaign aircraft, an E190. On October 13, 2009, the airline unveiled a modification to its livery in commemoration of the upcoming 10th anniversary of the airline in February 2010. Besides a new tail design, the revised livery includes larger "billboard" titles extending down over the passenger windows at the front of the aircraft. The logo word 'jetBlue' will no longer be silver and blue but now a dark, navy blue. The entry hall of T5 at John F. Kennedy International Airport. On October 22, 2008, jetBlue opened its new primary hub at John F. Kennedy International Airport (JFK), Terminal 5, or simply T5. The mostly new terminal, costing approximately $800 million, partially encircles the historic TWA Flight Center, the former Trans World Airlines terminal designed by Eero Saarinen, which remains closed. According to the plan, passengers will eventually be able to check in for flights in the landmark building, then transfer to the new structure via the original passenger departing-arrival tubes from Saarinen's original terminal and its 1969 addition by Roche-Dinkeloo. The first flight arrived from Bob Hope Airport (B6 #358) at 5:06 am followed by arrivals from Oakland International Airport and Long Beach Airport, respectively. The last flight to operate out of T6 was a departure to Rafael Hernández Airport in Aguadilla, Puerto Rico, departing at 11:59 pm. On June 16, 2010, jetBlue began selling snack boxes on Airbus A320 flights over 3 hours, 45 minutes. There are 5 options for $6 each. In March 22, 2010, jetBlue turned down incentives from the City of Orlando and announced its headquarters would keep its Forest Hills office, start leasing and using a new office in the Brewster Building in Long Island City, New York. in Queens Plaza in Long Island City, move its headquarters there in mid-2012, and start a joint branding deal with New York State using the iconic I Love NY logo. On October 14, 2010, the California Council of the Blind and three individuals with visual impairments have filed a lawsuit against jetBlue Airways in Federal Court on allegations that jetBlue's website and airport kiosks are not accessible. On October 18, 2011, CFO Ed Barnes resigned, effective immediately. The company's treasurer, Mark Powers, was appointed interim CFO until a replacement for Barnes could be found. On June 13, 2012, jetBlue ranked 'Highest in Customer Satisfaction Among Low Cost Carriers in North America' by J.D. Power and Associates, a customer satisfaction recognition received for the eighth year in a row. A jetBlue Embraer 190 taking off at Ronald Reagan Washington National Airport in Washington, D.C.. In October 2013, jetBlue introduced Mint, a premium cabin service on transcontinental and select Caribbean flights. The service began in 2014, using the Airbus A321-231 aircraft ordered by jetBlue. These planes are outfitted with winglets, as well as with "lie flat" seats, and moveable partitions that can create small suites on the airplane. Called "Mint" by jetBlue, these planes are configured with 16 business-class seats and 143 economy seats, instead of an all-economy configuration of 190 seats. On April 22, 2014, jetBlue's pilots voted to unionize for the first time since the airline was founded, with 71% casting ballots in favor of joining the ALPA. On September 18, 2014, Dave Barger announced his resignation from the company effective February 16, 2015, following several reports that investors and the board were unhappy with his performance. He was replaced on the board and as CEO by Robin Hayes. During the last few days of June and the first few days of July 2015, jetBlue began charging for bags in certain booking classes, leaving Southwest Airlines the only major U.S. carrier to not charge for bags. For the classes in which bag check fees are charged (generally the lowest class of fares offered; jetBlue offers 3 classes of fares), the cost is $20 for the first bag and $35 for the second, which is the lowest in the United States besides Frontier Airlines with similar prices. In 2016, jetBlue was unsuccessful in acquiring Virgin America, which was acquired by Alaska Air Group. A jetBlue Airways E190 at Westchester County Airport. In July 2016, jetBlue announced commercial flights from the United States to Cuba will commence in late August. On August 31, 2016, JetBlue Flight 387 from Fort Lauderdale–Hollywood International Airport to Abel Santamaría Airport, in Santa Clara, became the first scheduled commercial flight between the United States and Cuba in 55 years. Only charter flights were allowed under previous rules, which required that passengers had to arrive more than 4 hours before the scheduled departure and often endure long lines for documentation checks, late flight arrivals, and pay high baggage fees. In November 2016, jetBlue painted one of their Airbus A320 aircraft, N763JB, in a 1960s retrojet livery, dubbed "What's Old is Blue Again". The livery's maiden flight was on Friday, from New York JFK to Palm Springs. In July 2017, jetBlue announced it was taking qualifications to develop a terminal at JFK that would not only occupy terminal 5 but also the space of terminal 6 and 7. In April 2018, jetBlue announced their return to Ontario, California after 10 years, as well as new service to Steamboat Springs, CO, and Bozeman, MT. On 1 June 2018, jetBlue announced a refreshed design of its website jetblue.com. On 10 April 2019, jetBlue publically announced its intentions to serve Europe by converting thirteen existing A321neo orders to A321neoLRs, with London the initial city to be served some time in 2021 from New York JFK and Boston. Former headquarters, 80-02 Kew Gardens Road. 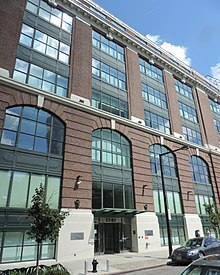 jetBlue's headquarters are in the Brewster Building in Long Island City, New York. jetBlue previously had its headquarters at 80–02 Kew Gardens Road, and then in the Forest Hills Tower, both in Forest Hills, Queens, New York City, 6 miles (9.7 km) from the current office in Long Island City. In 2001 the airline had announced that it wanted to take 74,000 square feet (6,900 m2) of space in the Forest Hills Tower, and by December 2002 announced that it planned to increase its leased space. In 2009, jetBlue announced that it was looking for a new headquarters location, and was considering moving either within the New York City metropolitan area or to the Orlando, Florida area. In April 2009, Helen Marshall, the president of the Borough of Queens, said that the City of New York was trying to keep JetBlue in the city; in January 2010, the CEO of JetBlue, Dave Barger, and Governor of Florida Charlie Crist met in Tallahassee, Florida to discuss a possible move to Orlando. A decision was expected by March 2010, although a move would not happen until 2012, when its lease in the Forest Hills Tower expired. On March 22, 2010, jetBlue announced it would remain in the New York City area, in Long Island City, because of the airline's historical links to the city, the cost of staff relocations, the airline's desire to retain access to financial markets, and because Aer Lingus and Lufthansa, jetBlue's marketing partners, fly into JFK Airport. jetBlue planned to combine its Forest Hills and Darien, Connecticut offices, together about 1,000 employees, into about 200,000 square feet (19,000 m2) in the Brewster Building by mid-2012. jetBlue's first major advertising campaign incorporated phrases like "Unbelievable" and "We like you, too". Full-page newspaper advertisements boasted low fares, new aircraft, leather seats, spacious legroom, and a customer-service-oriented staff committed to "bringing humanity back to air travel". With a goal of raising the bar for in-flight experience, jetBlue became the first airline to offer all passengers personalized in-flight entertainment. In April 2000, flat-screen monitors installed in every seatback allow customers live access to over 20 DirecTV channels at no additional cost. As jetBlue gained market share, they found a unique positioning where they competed with other low-cost carriers (e.g. Southwest, and Frontier), as well as major carriers (e.g. American, United, and Delta). Amenities such as their live in-flight television, free and unlimited snack offerings, comfortable legroom, and unique promotions fostered an image of impeccable customer service that rivaled the major airlines, while competitive low fares made them a threat to low-cost no-frills carriers as well. During the company's growth stage, advertising messages moved from the engaging and customer oriented to less personal slogans and campaigns. Frequent changes in its values statements resulted in mixed and frequently wasted marketing dollars spent. Slogans varied from “More” to “Happy Jetting” and many other failed attempts. A new marketing strategy has been partnerships with professional sports teams and venues. As the official airline of the New York Jets, JetBlue has specially painted the exterior of one of their Airbus A320s (N746JB) in the team's colors. Aircraft N605JB is based on the design of the Boston Red Sox road uniform and sports a grey fuselage with navy lettering. This aircraft was unveiled in February 2012, just in time for the opening of the Red Sox new spring training facility in Fort Myers, Florida named JetBlue Park at Fenway South. Additionally, JetBlue and MasterCard have pledged to refund select flight purchases made online at JetBlue.com using a MasterCard. JetBlue has also partnered with various other sports teams and sporting venues in cities they serve. jetBlue also utilizes various forms of advertising media. They use print, online, and television ads as well as advertisements on popular social media sites including Hulu and YouTube. jetBlue emphasizes a secondary slogan, "If you wouldn't take it on the ground, don't take it in the air" poking fun at competitors with hidden fees, little, or no amenities and what jetBlue considers an unacceptable level of customer service. According to Martin St. George, senior vice president of marketing and commercial strategy at jetBlue, the new "You Above All" campaign was created to get jetBlue back to their "DNA" and speak to the "core of who we are as a brand". This motto is meant to support their efforts to always put the customer first and "bring humanity back to air travel". In February 2007, a Valentine's Day storm triggered an "organizational meltdown" leading to an extremely high level of cancellations and controversies. For example, some passengers were held on board their plane awaiting clearance for take off for nearly 11 hours before they returned to their gate and the flight was cancelled. Various consumer rights organizations and activists called for the creation of a government mandated “Bill of Rights” to protect air travelers from future experiences similar to the one previously described. On February 20, 2007, jetBlue released an apologetic response to the events that had taken place less than a week before with the creation of their Customer Bill of Rights, which offers financial reciprocation if a customer's flight is delayed or cancelled. As of April 2019, jetBlue Airways flies to 102 destinations in North, Central, and South America; including destinations in Aruba, The Bahamas, Barbados, Bermuda, Cayman Islands, Colombia, Costa Rica, Cuba, the Dominican Republic, Ecuador, Grenada, Haiti, Jamaica, Mexico, Peru, Puerto Rico, Saint Maarten, Saint Lucia, Trinidad and Tobago, Turks and Caicos Islands, and the United States. On May 6, 2015, jetBlue was one of the first airlines to be granted a license to commence charter flights to Cuba, with flights departing from New York City. The weekly service began on July 3, 2015, with 150-seat Airbus A320s. jetBlue primarily operates a point-to-point route network: in 2017, over 92% of its passengers flew on nonstop itineraries. In 2008, jetBlue partnered with Irish flagship carrier Aer Lingus to allow passengers to switch between airlines on a single ticket for flights with connections in New York–JFK or Boston Logan. Unlike traditional codeshare agreements, the companies cannot sell seats on each other's flights, so customers initiate the purchase on one airline's website and then are transferred to the other site to complete the transaction. After making a codeshare agreement with Lufthansa that went into effect in 2010, jetBlue transitioned to the Sabre reservation system used by Lufthansa, enabling the airlines to sell tickets on each other's flights, transfer luggage and passengers between the two carriers, and combine frequent flyer programs,. By making use of JetBlue's North America routes as a feeder network, the agreement put Lufthansa in a position to operate quasi-hubs in New York–JFK and Boston Logan. Also in 2010, JetBlue entered into interline booking agreements with South African Airways and American Airlines to facilitate luggage transfers between airlines for passengers with connecting flights on a different carrier. The agreement with American included JetBlue's 18 destinations not served by American and American's 12 international flights out of New York–JFK and Boston Logan. In addition, American gave JetBlue 8 round trips slots out of Washington National in D.C. and 2 out of Westchester, New York. In return, JetBlue gave American 6 round trips out of New York–JFK. The agreement with American Airlines has since ended according to JetBlue's website. In 2011, JetBlue made interline agreements with Virgin Atlantic and Jet Airways, both of which have since been terminated. Since 2012, JetBlue has had an interlining agreement with Air China. It also established an interline agreement with Porter Airlines connecting from Billy Bishop Toronto City Airport to US destinations through Boston and Newark. Airbus A220-300 — 60 TBA Deliveries begin in 2020. To be replacing Embraer 190 fleet. Airbus A320-200 113 — — 42 108 150 To be reconfigured to 162 seats. Airbus A321neo — 72 TBA Deliveries begin in 2019. Airbus A321LR — 13 TBA Deliveries begin 2021. Converted from Airbus A321neo orders. Embraer 190 60 — — 16 84 100 To be replaced by A220-300 and A321neo from 2020. JetBlue offers Core (Main Cabin) seating across its fleet. The Core cabin includes leather seats, complimentary Wi-Fi, complimentary entertainment screens with DIRECTV, Sirius XM Radio, and movies, as well as complimentary snacks and non-alcoholic drinks. Mint is JetBlue's premium class service and is available coast to coast and on select Caribbean routes on configured Airbus A321s. It includes fully lie-flat seats, some of which have sliding panels for more privacy. The table below shows the routes on which the service is available. JetBlue's in-flight options consist of gate-to-gate Fly-Fi service, offering over one hundred channels of DIRECTV, Sirius XM Radio, and movies, and on the Airbus A321, a 15″ interactive video screen which is not available on the rest of the fleet. JetBlue's partnership with Amazon lets customers watch Amazon Prime videos by connecting to Wi-Fi and downloading the Amazon Video app on their mobile phone or tablet. The in-flight WiFi under the "Fly-Fi" network is complimentary on all flights, at speeds of 12–15 megabits per second. JetBlue's frequent-flyer program is called TrueBlue. Under the original TrueBlue program, flights were worth two, four, or six points based on distance of the flights, and double points were awarded for flights booked online. In September 2009, JetBlue made changes to its TrueBlue program. In the new program, members receive three points for every dollar spent toward a flight, excluding taxes and fees, plus an additional three points for every dollar spent on a flight if booked online directly on the JetBlue.com website. Additional points are awarded if the member uses the Barclay's issued JetBlue Mastercard credit card to purchase the flight. The price of flights in points depend on the fare of the flight in U.S. dollars. The new program launched on November 9, 2009. In June 2013, JetBlue announced that TrueBlue points will never expire for any reason. JetBlue Technology Ventures (JTV)  is a wholly owned subsidiary of JetBlue that was established in February 2016. JTV is the venture capital arm of JetBlue that invests in and partners with early-stage startups in the travel, hospitality, and transportation space. Its mission is to improve the end-to-end experience of travelers everywhere. As of November 2018, JTV has invested in 21 startups, including hybrid planes, machine learning algorithms, and ground transportation. Investments range in size from $250,000 to $1 million. On October 25, 2016 JetSuiteX announced that JetBlue had made a minority equity investment in JetSuiteX. Part of the agreement also gave JetBlue a seat on JetSuite's board of directors. Reasons for the investment was outlined by CEO Robin Hayes "Our investment in JetSuite makes sense as we continue to execute on our west coast plan and invest in innovative ideas that reflect the disruptive spirit of JetBlue." In JetBlue's 1st quarter 2018 investor call JetBlue's CFO Steven Priest Confirmed they currently hold about 10%  of JetSuiteX. The TWA Hotel is the TWA Flight Center structure currently being rebuilt as 505-room hotel, preserving the Eero Saarinen headhouse while replacing the structures on either side of the headhouse. Situated in front of JetBlue's JFK terminal, JetBlue has stated that it estimates the ownership of the hotel would be between 5–10% of the final total investment. The hotel will be an effective replacement for the Ramada Plaza JFK Hotel on the north end of the airport grounds in Building 144, which closed in 2009. LiveTV was bought by JetBlue in 2002 and became a wholly owned subsidiary until it was sold to Thales for nearly $400 million in June 2014. JetBlue Flight 292, an Airbus A320 (N536JB), makes an emergency landing at Los Angeles International Airport. September 21, 2005: Flight 292 en route from Burbank, California, to New York City performed an emergency landing at Los Angeles International Airport (pictured on the right) following a failure of the front landing gear during retraction when it turned 90 degrees. The plane landed after holding for about three hours to burn fuel and therefore lighten the aircraft. The aircraft came to a stop without incident on runway 25L, the second-longest runway at LAX. The only apparent damage to the plane upon landing was the destruction of the front wheels, which were ground down to almost semicircles, and the tires; the front landing strut held. The passengers were unable to see themselves landing despite the DirecTV service in each seat, as they were instructed to brace. March 27, 2012: Flight 191 en route from New York City, to Las Vegas performed an emergency landing at Rick Husband Amarillo International Airport after the captain, Clayton Osbon, was locked out of the cockpit and subdued by passengers after he started acting erratically and ranting about terrorists. It is believed that Osbon suffered from an unspecified mental breakdown, and was treated by Northwest Texas Healthcare System. There were no fatalities. ^ a b c "2010 Form 10-K, JetBlue Airways Corporation". United States Securities and Exchange Commission. ^ a b c "JetBlue 2017 Annual Report" (PDF). p. 8. Retrieved September 19, 2018. We are a predominately point-to-point system carrier, with the majority of our routes touching at least one of our six Focus Cities: New York, Boston, Fort Lauderdale-Hollywood, Orlando, Long Beach and San Juan, Puerto Rico. During 2017, over 92% of our Customers flew on nonstop itineraries. ^ JetBlue Launches New Advertising and | Marketing Campaign: You Above All(TM). Investor.jetblue.com (October 14, 2010). Retrieved December 22, 2010. ^ Schlangenstein, Mary (September 19, 2015). "JetBlue Airways Pipes Up to Delta: Leave 'Humanity' Alone". Bloomberg L.P. Retrieved December 8, 2016. ^ a b c d e f "JetBlue Airways Corporation 2017 Annual Report (Form 10-K)". sec.gov. U.S. Securities and Exchange Commission. January 2018. ^ "Jetblue 2002 Annual Report Archived February 9, 2009, at the Wayback Machine." JetBlue. Retrieved January 29, 2009. ^ "Fortune 500 Companies 2018: Who Made the List". Fortune. Retrieved April 4, 2019. ^ "Corporate Stats and Facts". MediaRoom. JetBlue. April 4, 2014. Retrieved April 4, 2019. ^ "JetBlue". JetBlue. Archived from the original on April 19, 2012. Retrieved April 25, 2012. ^ "Directory: World Airlines". Flight International. April 3, 2007. p. 98. ^ Zuckerman, Laurence (June 5, 2008). "JetBlue, Exception Among Airlines, Is Likely to Post a Profit". The New York Times. Retrieved November 7, 2001. ^ Maynard, Micheline (June 5, 2008). "More Cuts as United Grounds Low-Cost Carrier". The New York Times. Retrieved June 4, 2008. ^ "JetBlue Airways Press Release: Taking the JetBlue Experience to New Heights". Investor.jetblue.com. December 14, 2006. Archived from the original on January 27, 2013. Retrieved April 25, 2012. ^ JetBlue Airways: Growing Pains? ICMR Case Study. Retrieved November 2, 2010. ^ JetBlue fiasco: $30M price tag Retrieved November 2, 2010. ^ "Embraer tackles JetBlue E-190 software glitches – 3/13/2007". Flight Global. March 13, 2007. Retrieved January 17, 2014. ^ Schlangenstein, Mary (March 6, 2007). "JetBlue to Idle E190s for Work, Add ExpressJet Planes (Update4)". Bloomberg. Retrieved January 17, 2014. ^ "Another suicidal board? How DuPont's directors failed Ellen Kullman". Fortune magazine. October 13, 2015. Retrieved November 10, 2015. ^ Schlangenstein, Mary; David Mildenberg (May 10, 2007). "JetBlue Air Names Barger to Succeed Neeleman as Chief". Bloomberg L.P. Retrieved October 12, 2010. ^ "Jettisoned at JetBlue". Daily News. May 11, 2007. Retrieved October 12, 2010. ^ "unknown" (Press release). Associated Press. July 24, 2007. ^ "The Simpsons to appear in 7-Elevens, fly JetBlue". DMNews.com. Retrieved December 22, 2018. ^ "Product Placement News". Archived from the original on September 29, 2007. Retrieved March 5, 2011. ^ "Jet Blue news release". November 8, 2007. Archived from the original on July 21, 2012. Retrieved November 13, 2007. ^ JetBlue | Airline Tickets, Flights, and Airfare. Happyjetting.com. Retrieved December 22, 2010. ^ Flying. It's Why JetBlue Created Jetting. (Nasdaq:JBLU). Globenewswire.com. Retrieved December 22, 2010. ^ Shwiff, Kathy (May 21, 2008). "JetBlue Solidifies Succession Plan". The Wall Street Journal. ^ JetBlue to charge $7 for pillow, blanket. Daily News (August 4, 2008). Retrieved December 22, 2010. ^ "unknown". Archived from the original on September 6, 2008. ^ Mutzabaugh, Ben (November 7, 2008). "2008-11-07". USA Today. Retrieved March 5, 2011. ^ Photos: Airbus A320-232 Aircraft Pictures. Airliners.net. Retrieved December 22, 2010. ^ Russell, James S. (October 23, 2008)"JetBlue's New Terminal at JFK Offers Huge Capacity, No Charm", Bloomberg. ^ T-508. T-508. Retrieved December 22, 2010. ^ About JetBlue | JFK Airport Archived August 15, 2008, at the Wayback Machine. JetBlue. Retrieved December 22, 2010. ^ Complimentary Snacks and Drinks Archived December 17, 2010, at the Wayback Machine. JetBlue. Retrieved December 22, 2010. ^ "Twitter status". JetBlue Airways. March 12, 2010. ^ Mutzabaugh, Ben (March 22, 2010). "JetBlue turns down Orlando incentives, will keep headquarters in New York City". USA Today. ^ "JetBlue CEO talks of moving headquarters to Orlando". FlyerTalk. January 20, 2010. ^ a b c Bomkamp, Samantha (March 22, 2010). "JetBlue to remain New York's 'hometown' airline". USA Today. Associated Press. ^ a b "JetBlue Plants Its Flag in New York City with New Headquarters Location" (Press release). JetBlue Airways. March 22, 2010. Archived from the original on July 18, 2014. Retrieved March 5, 2011. ^ a b Mcgeehan, Patrick (March 22, 2010). "JetBlue to Remain 'New York's Hometown Airline'". The New York Times. Associated Press. Retrieved March 5, 2011. ^ McGeehan, Patrick (March 22, 2010). "JetBlue to Move West Within Queens, Not South to Orlando". The New York Times. Retrieved March 5, 2011. ^ Accessibility Lawsuit Filed Against JetBlue Airways – Law Office of Lainey Feingold. Lflegal.com (October 14, 2010). Retrieved December 22, 2010. ^ Molnar, Matt (October 18, 2011). "JetBlue CFO Ed Barnes Resigns". NYCAviation. ^ "JetBlue Awarded Seventh Consecutive Customer Satisfaction J.D. Power and Associates Honor", JetBlue Airways Archived August 12, 2011, at the Wayback Machine, June 16, 2011. ^ "Mint™: JetBlue's refreshing take on a premium experience". JetBlue. Retrieved April 3, 2015. ^ Sheridan, Patrick (April 22, 2014). "JetBlue pilots vote to unionize". CNNMoney. Retrieved April 22, 2014. ^ "JetBlue CEO Fires Back at Wall Street Analysts". Bloomberg Business. August 26, 2014. Retrieved February 18, 2015. ^ "Six Reasons JetBlue's CEO Probably Won't Stick Around". Bloomberg Business. May 7, 2014. Retrieved February 18, 2015. ^ "JetBlue's CEO vies to please passengers, stocks". The Salt Lake Tribune. February 16, 2015. Retrieved February 18, 2015. ^ "JetBlue Baggage Fees". Retrieved February 11, 2016. ^ Finance (April 9, 2016). "Retrieved 7 May 2017". Businessinsider.com. Retrieved November 6, 2017. ^ Talty, Alexandra (July 29, 2016). "JetBlue Announces $99 Flight to Cuba, Starting August 31". Forbes. Retrieved July 30, 2016. ^ Mutzabaugh, Ben (July 28, 2016). "JetBlue: First Cuba flights will launch next month". USA Today. Retrieved August 1, 2016. ^ Robles, Frances (August 31, 2016). "Scheduled Flights to Cuba From U.S. Begin Again, Now With Jet Engines". The New York Times. Retrieved August 31, 2016. ^ Mutzabaugh, Ben (November 15, 2016). "First look: JetBlue unveils special 'RetroJet' paint scheme". USA Today. Retrieved January 4, 2017. ^ "JetBlue Issues Request for Qualifications to Developers for JFK Airport Terminal Project". mediaroom.jetblue.com. Retrieved December 11, 2017. ^ "JetBlue Adds New Cities and Routes as It Advances West Coast Strategy". mediaroom.jetblue.com. Retrieved April 25, 2018. ^ "JetBlue Unveils a Refreshed JETBLUE.COM". blueir.investproductions.com. Retrieved June 14, 2018. ^ a b c d e "2010 Annual Report" (PDF). February 24, 2011. Archived from the original (PDF) on December 8, 2017. Retrieved September 21, 2017. ^ a b "2015 Annual Report" (PDF). February 17, 2016. Archived from the original (PDF) on December 15, 2017. Retrieved September 21, 2017. ^ "2011 Annual Report" (PDF). February 28, 2012. Archived from the original (PDF) on December 8, 2017. Retrieved September 23, 2017. ^ a b c d e "2016 Annual Report" (PDF). February 17, 2017. Archived from the original (PDF) on July 13, 2017. Retrieved September 21, 2017. ^ "2012 Annual Report" (PDF). February 20, 2013. Archived from the original (PDF) on December 8, 2017. Retrieved September 23, 2017. ^ "2013 Annual Report" (PDF). February 18, 2014. Archived from the original (PDF) on December 8, 2017. Retrieved September 22, 2017. ^ "2014 Annual Report" (PDF). February 12, 2015. Archived from the original (PDF) on December 15, 2017. Retrieved September 22, 2017. ^ "2017 Annual Report" (PDF). February 17, 2018. Retrieved July 22, 2018. ^ a b Cuozzo, Steve. "JetBlue Triples Size of its Queens Offices." New York Post. December 24, 2002. Retrieved on January 20, 2010. "74,000 square feet at 118–29 Queens Blvd., also known as Forest Hills Tower" and "Boulevard in Forest Hills – possibly the largest office lease in Queens this year. JetBlue was previously at 80–02 Kew Gardens Rd., across the street." ^ "Jetblue Boston Marathon Invitational entry Essay Contest Archived October 11, 2008, at the Wayback Machine." JetBlue Airways. Retrieved on May 18, 2009. ^ "Leave New York City? Fuggedaboutit! Archived December 15, 2013, at the Wayback Machine" JetBlue Airways. March 22, 2010. Retrieved on August 23, 2012. ^ Clarke, Sarah K. and Scott Powers. "Orlando is a front-runner for JetBlue headquarters." Orlando Sentinel. October 13, 2009. Retrieved on October 14, 2009. ^ Newman, Philip. "Forest Hills' JetBlue looks for new space around city." Forest Hills Ledger. Wednesday April 8, 2009. Retrieved on January 20, 2010. ^ Hafenbrack, Josh. "JetBlue considering move to Orlando Archived January 23, 2010, at the Wayback Machine." Orlando Sentinel. January 19, 2010. Retrieved on January 19, 2010. ^ "JetBlue CEO talks of moving headquarters to Orlando." Associated Press at USA Today. January 20, 2010. Retrieved on January 20, 2010. ^ Mutzabaugh, Ben. "Will JetBlue move its headquarters from New York to Orlando?." USA Today. Retrieved on January 20, 2010. ^ JetBlue to remain 'New York's Hometown Airline' – Yahoo! Finance[permanent dead link]. Finance.yahoo.com. Retrieved on 2010-12-22. ^ "JetBlue to Keep NYC Headquarters, Rejecting Orlando (Update3)." Bloomberg Businessweek. March 22, 2010. Retrieved on July 6, 2010. ^ "JetBlue Plans New Focus City At Orlando International Airport". JetBlue. Archived from the original on July 8, 2013. Retrieved September 13, 2013. ^ JetBlue Airways Open For Business. JetBlue. 01/11/2000. Retrieved December 22, 2010. ^ JetBlue Decides Not To Charge For 24-Channel LiveTV Inflight Satellite Entertainment Service. JetBlue (July 25, 2000). Retrieved June 9, 2013. ^ Photo Release – JetBlue and Bliss Spa Say Buh-Bye to Red-Eye, Hello to Shut-Eye Service: Shut-Eye Service Tailored for Customers on Trans-Continental Night Flights Archived October 19, 2006, at the Wayback Machine. Investor.jetblue.com (April 4, 2006). Retrieved December 22, 2010. ^ a b JetBluePress Releases. Jetblue.com. Retrieved December 22, 2010. ^ Blue Turns Green as JetBlue Airways Unveils Specially Painted Airbus A320 Aircraft Paying Homage to the New York Jets. Investor.jetblue.com. Retrieved December 22, 2010. ^ Zeller Jr., Tom. "Held Hostage on the Tarmac: Time for A Passenger Bill of Rights?, The Lede – New York Times. Feb. 16, 2007. Web. Nov. 11, 2010. ^ Jaffe, Matthew. "JetBlue Offers Passengers Bill of Rights". ABC News. Feb. 20, 2007. Web. Nov. 11, 2010. ^ "Where We Jet: Flight Destinations". JetBlue. Retrieved October 23, 2011. ^ "US approves ferry service between Cuba and Florida". BBC News. May 6, 2015. Retrieved May 29, 2015. ^ Winship, Tim (May 8, 2015). "Cuba: JetBlue Announces New Routes to Havana". Smarter Travel. ^ Julie Kliegman (July 4, 2015). "JetBlue first major airline to offer direct NYC-Cuba flights". The Week. Retrieved July 4, 2015. ^ "JetBlue converts to 13 A321LRs, commits to London service". FlightGlobal. Retrieved April 11, 2019. ^ / Lufthansa Takes JetBlue Under Its Wings. (December 14, 2007). Retrieved April 25, 2014. ^ JetBlue Leaves Open Skies for Sabre | BNET. Industry.bnet.com (February 23, 2009). Retrieved December 22, 2010. ^ JetBlue Airways and South African Airways Proudly Announce New Interline Agreement. effective May 12, 2010, travelers can purchase flights between all JetBlue destinations and 40 SAA cities in Southern Africa via New York's JFK Airport. Investor.jetblue.com. Retrieved December 22, 2010. ^ American Airlines Bolsters Commitment to New York by Enhancing Network, Schedule, Facilities and Fleet at New York's Airports, and Introduces New Partnerships With JetBlue Airways and NYC & Company – Mar 31, 2010. Aa.mediaroom.com (March 31, 2010). Retrieved December 22, 2010. ^ BlueTales » JetBlue » Connecting Customers to more destinations worldwide. Blog.hellojetblue.com (March 31, 2010). Retrieved December 22, 2010. ^ "Airline Spotlight: JetBlue Airways Soars". Flight Network. Retrieved March 2, 2015. ^ "JetBlue and Jet Airways to Partner on Interline Service to Brussels and... – NEW YORK, Nov. 2, 2011 /PRNewswire/". New York, India, Belgium: Prnewswire.com. Retrieved March 31, 2012. ^ "Airline Partner – JetBlue". Porter Airlines. ^ "Profile on jetBlue Airways". CAPA. Centre for Aviation. Archived from the original on October 29, 2016. Retrieved October 29, 2016. ^ "Partner airlines – JetBlue". www.jetblue.com. ^ Azul S.A. "Azul and JetBlue Announce Codeshare Agreement". prnewswire. Retrieved May 23, 2018. ^ "Code Share Agreement with jetBlue B6 Airline". EL AL. EL AL. ^ "With which airlines does Emirates operate Codeshare flights?". Emirates. Emirates. Retrieved May 23, 2018. ^ "Codeshare Agreement Puts JetSuiteX Flights in JetBlue Booking Channels". businesstravelnews. Retrieved May 23, 2018. ^ "Our planes". jetblue.com. Retrieved July 11, 2018. ^ "JetBlue Airways Fleet Details and History". planespotters.net. Retrieved July 11, 2018. ^ a b "JBLU Investor Update: April 25, 2017" (PDF). Retrieved December 11, 2017. ^ "JetBlue orders 30 additional A321 aircraft". Airbus. July 26, 2016. Retrieved July 26, 2016. ^ "JetBlue Selects Airbus A220-300 as Key Component of Its Next Generation Fleet". Retrieved July 10, 2018. ^ "JetBlue | Help Inflight entertainment". help.jetblue.com. Retrieved June 23, 2018. ^ "JetBlue Airways and Dunkin Donuts Extend Partnership". Dunkin' Donuts. Retrieved June 23, 2018. ^ "jetBlue set to launch London to US flights". Independent. Retrieved March 6, 2019. ^ Johnston, Morgan (April 12, 2016). "A monu-MINT-al expansion – Out of the Blue". Blog.jetblue.com. Retrieved November 6, 2017. ^ "TrueBlue program: Jet more and earn award flights". JetBlue. Archived from the original on July 5, 2008. Retrieved October 23, 2011. ^ JetBlue's Revamped TrueBlue Program Touches Down. Investor.jetblue.com. November 11, 2009. Retrieved December 22, 2010. ^ JetBlue | TrueBlue: Frequently asked questions. Trueblue.jetblue.com. Retrieved December 22, 2010. ^ "JetBlue | TrueBlue: Start earning". Trueblue.jetblue.com. Retrieved July 4, 2013. ^ "JetBlue | TrueBlue: Reasons to join". Trueblue.jetblue.com. Retrieved July 4, 2013. ^ "JetBlue Technology Ventures". Jetblueventures.com. July 14, 2017. Retrieved November 6, 2017. ^ a b "SEC-Show". otp.investis.com. Retrieved July 8, 2017. ^ "This Startup Backed By JetBlue And Boeing Plans On Flying Electric Planes By The Early 2020s". April 5, 2017. Retrieved July 8, 2017. ^ "JetBlue Technology Ventures Selects Silicon Valley-Based FLYR as Its First Strategic Investment". www.businesswire.com. Retrieved July 8, 2017. ^ "JetBlue Technology Ventures Announces Investment In Ground Transportation Services Startup, Mozio – PYMNTS.com". Archived from the original on May 29, 2017. Retrieved July 8, 2017. ^ Rao, Leena. "Why Is JetBlue In Silicon Valley?". Fortune. Retrieved July 8, 2017. ^ "JetSuite – JetBlue Makes Strategic Investment in JetSuite". x.jetsuite.com. Retrieved July 8, 2017. ^ Priest, Steve. "CFO". Seeking Alpha. Seeking Alpha. Retrieved April 27, 2018. ^ "JetBlue Completes Sale of LiveTV Subsidiary to Thales Group". mediaroom.jetblue.com. Retrieved December 11, 2017. ^ "Jetblue moves travel products unit to broward". Sun-sentinel. Retrieved October 6, 2018. ^ LAX05IA312. Ntsb.gov. Retrieved December 22, 2010. ^ "JetBlue Pilot Charged with Interference with a Flight Crew" (Press release). FBI. Retrieved April 3, 2015. ^ "Osbon Complaint Affidavit" (PDF). Retrieved July 8, 2017. ^ Nicas, Jack; Pasztor, Andy (March 28, 2012). "JetBlue Captain's 'Medical Situation' Diverts Flight". The Wall Street Journal. Retrieved March 29, 2012.